A Large Size, Thin, Rare Type, Visibly Aged, Nicely Notched And Well Made Howard County Point That Exhibits Surface Sheen And Stone Aging Coloration Patination, Aging In The Notches, Correct Style Blade Flaking, Aged Surface Deposits, Correct Ancient Light Blade Edge Sharpening, Correct Light Basal Stem Edge Dulling, Correct Material And Manufacture For The Area Found. Ex-Tom Vaughn Collection. This Nice Example Displays Good Workmanship Being Made On A Flake, With A Small Portion Visible On One Side. 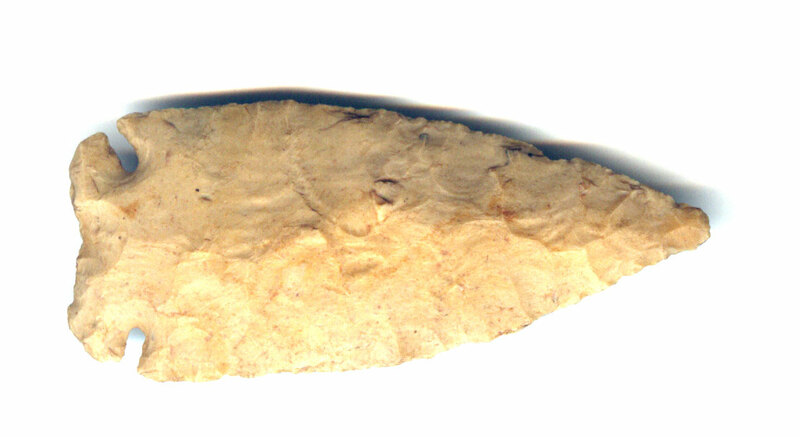 This Is A Collectible Example Possibly Related To The Kessel And Cache River Points. Includes A Ken Partain Certificate Of Authenticity.